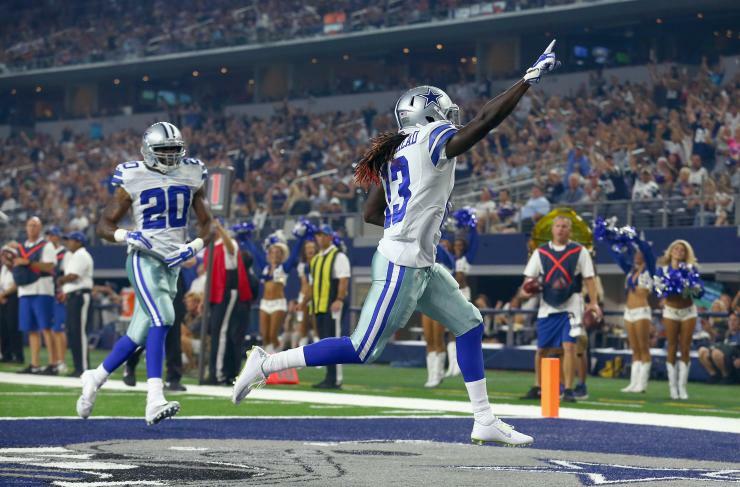 On Monday Night Football, the Dallas Cowboys received contributions from a variety of players, one of those players being first-year player Lucky Whitehead. Whether it was his kick and punt returns or his reverse carries, Whitehead made a play every time he touched the football. The 2015 season has been a struggle for the Cowboys' offense. Not only do they turn the football over, but they also struggle to sustain. A large reason because of that has been the play of Matt Cassel. When the Cowboys get the football out quickly to their playmakers, they tend to have much more success than when Cassel is holding the football in a three-step drop-back. That said, the Cowboys have to get the ball out to guys like Dez Bryant, Jason Witten, Cole Beasley, and, now, Whitehead. Football is a game of speed and if the Cowboys can involve both Beasley and Whitehead in sub packages, they will have a lot more success. The problem I have with the Cowboys' play-calling is that they continue to not change their formations regarding the philosophy. If Tony Romo is in, the Cowboys can use any package they want, but they can't do that with Cassel. However, Scott Lineman continues to call plays that Romo can make, but Cassel can't. For a backup quarterback to succeed, he needs to not turn the football over and get the ball out to his playmakers. But that's something Cassel hasn't done all year. Insert a guy like Whitehead, a guy that is simply a matchup-nightmare for the opposition. Going forward, the Cowboys should continue to deploy Whitehead in a way where he can beat the defense. That means getting him the ball in space and giving him the opportunity to win with his speed and athleticism. Dallas misses a Lance Dunbar type of player in their offense. By giving Whitehead a bigger role, the Cowboys would have a guy that can hit a home run when one may be needed. Against the Green Bay Packers on Sunday, the Cowboys need to be smarter with their play-calling. If running the football doesn't work, Dallas will need to win by the pass. Bryant will be double-teamed and Witten will be game-planned for. Whitehead needs to be given more work. Dallas will need to come up with ways to get him the football in open space. An online sports writer for about three years now, Ryan is a die-hard Dallas Cowboys fan. He writes about his favorite team on Inside The Star. Ryan also writes for other publications like Roster Watch, Rant Sports, and Cuse Nation. Ryan is a freshman at Syracuse University majoring in Information Management and Technology. You can follow him on Twitter @RyanRattyNFL.